The Senate Rules and Judiciary Committee voted four measures to the full Senate for further consideration at its next meeting. The action took place Thursday. 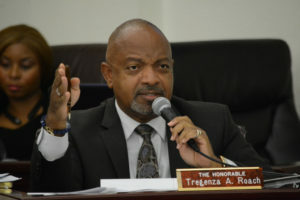 Sen. Tregenza A. Roach introduced the bill addressing how a state of emergency is extended in the territory. Presently an extension is made by the governor. The bill would allow the Legislature to be part of that decision-making process. Sen. Nereida Rivera O’Reilly spoke to a bill that would expand treatments optometrists could provide. Specifically, the act would allow optometrists to prescribe eye drops for the treatment of glaucoma. She emphasized the act did not allow optometrists to perform surgery. Rivera-O’Reilly also introduced a bill to define urgent-care facilities and and to exempt urgent-care facilities from needing a certificate of need. She is co-sponsor of the bill with Sen. Kurt Vialet. She said the bill would stimulate the competition for such facilities on the islands and is in line with what has already been done in most states.